This is one of the best high resolution camera and DVR that is built right into the key chain. Covert. This model looks like your average car keychain. 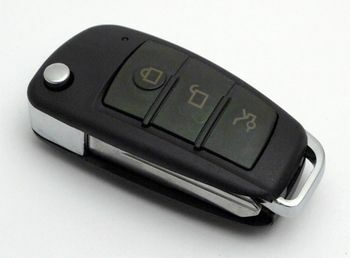 The plain black design is inconspicuous when casually hung on a lanyard or among other keys. High resolution video and images. This device is cointains a full HD 1920 x 1080 resolution camera. Supports SD cards. Using micro sd cards this can record to cards are large as 32 GB, allowing up to 6 hours of high definition video storage. Ever wished you had a picture of the damage from an accident in an insurance dispute or even record interactions with police officers?. You wouldn't have to wish if you had the KCS820 on your keychain.